Happy Homecoming, and what a day for it! 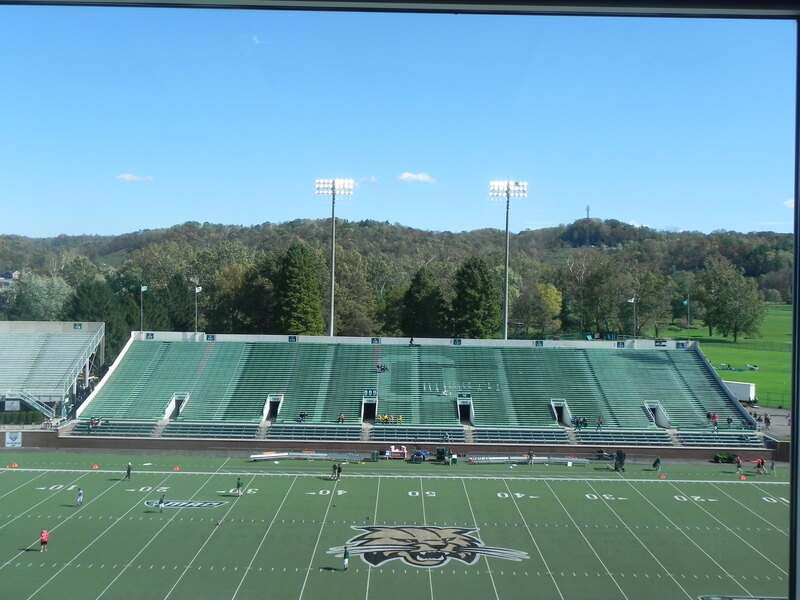 I have a hard time believing that there is a more beautiful setting in college football in fall than Peden Stadium. Ohio is looking to rebound after a terrible loss to Buffalo last week against a less than stellar Ball State Cardinals squad that is coming off a 42-0 loss to Temple. -Warrior Jeff King will be wearing the number 62 today in honor of Marcellus Williamson. -Wicked winds here along the Hocking today. Gusts are expected in excess of 40 mph. It’s going to affect the kicking, punting and passing games. -LaVon Brazill needs eight receptions to become Ohio’s all-time leader in receptions. -Reps from the Cincinnati Bengals and New York Giants have spots in the box today. No idea who they are here to look at but it’s getting to that time where we see scouts around Peden. -As it plays on the video board, I can’t stress enough how good The Bobcat Showcase on WOUB is. It covers all Ohio sports and does a great job of covering the teams from unique angles. You can check out full episodes HERE. 2:43- Ball State is 3-3 but like previous opponents they have been battle-tested. They have played Oklahoma, South Florida and Indiana. 2:50- Ball State quarterback Sean Baker has thrown the most interceptions in the nation. The Bobcat secondary has feasted on turnovers all season and could use some today. 3:00- Now that I’m done feeling bad for myself over another horrid effort from the Pitt Panthers, some more news. DL Neal Huynh is still a couple of weeks away from playing and won’t dress. CB Xavier Hughes is officially out for the year. 3:09- Tyler Tettleton has been incredibly efficient. He is one of 11 quarterbacks in D-I with at least 1o touchdowns and two or less interceptions. He is in the same company with players such as Robert Griffin III and Andrew Luck. 3:30- Just about game time and the place has filled up. The crowd is louder than in past home games so it should be a very fun afternoon of football. 3:34- Teams are out. Rufus’s motorcycle has returned. Ball State will start with the ball. Let’s play. 3:42- Both teams can’t get much going on their first drives. With the wind, the run game will be very important. Donte Harden had 11 yards on his first carry but the drive stalled immediately after. 3:48- Ohio forces another three and out and has much better field position on the Ball State 38. 3:55- LaVon Brazill gives the crowd some life with an impressive 37 yard return on a 65 yard punt that featured a huge block by Mose Denton. 3:58- A bit puzzling how Ohio continues to pass when it clearly isn’t working so far. 4:02- 11 minutes in Ball State gets the first 3rd down conversion of the day. They are driving, now inside the Ohio 35. 4:06- END OF THE FIRST QUARTER: Ball State 0 Ohio 0. Pretty mundane quarter of football there, but we have seen things get crazy i a relatively short amount of time. -Ball State is in the middle of a 5:43 drive and are down to the Ohio 20. They have figured out a way to move the ball with the wind.Ohio should look to do the same. -Just 24 total yards for the Bobcats- 21 rushing, 3 passing. It would be in their best interest to keep the ball on the ground. -Time of possession: Ball State-11:05 Ohio: 3:55. 4:11- 14 play 59 yard drive is capped with a field goal. Ball State 3 Ohio 0. 4:16- Funny how Ohio gets a first down and the chain gang forgets to move the sticks as they were asleep from the lethargic first quarter. 4:18- Six for the ‘Cats on a reverse pass from Phil Bates to LaVon Brazill for the score. 7-3 Bobcats after tripling their 1st quarter output on their first drive of the 2nd. That is Brazill’s 6th TD of the season and he is now just three receptions away from the all-time mark. 4:36- We’ve hit another lull in the middle of the second. 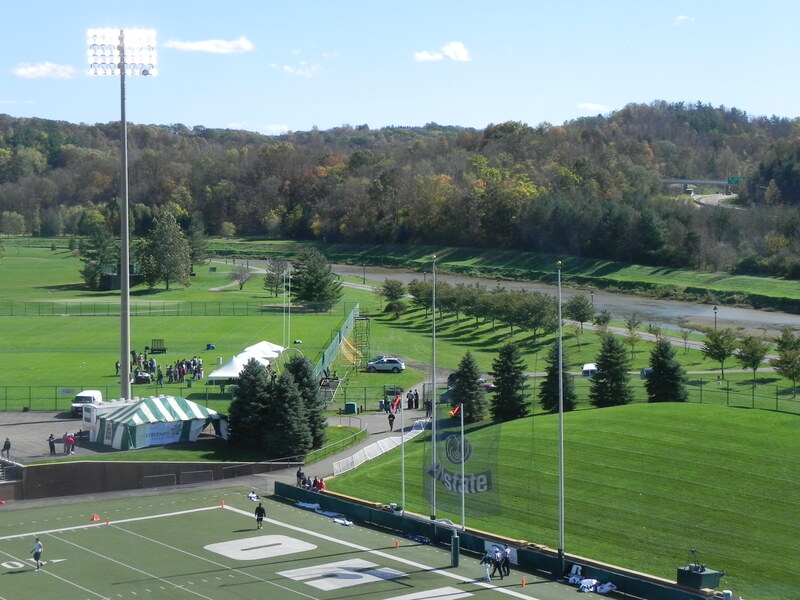 BSU trying to make the best of good field position starting their drive on the Ohio 46. 4:40- BSU gets down to the OU 24 before stalling. The Bobcats dodge a bullet when Steven Schott misses the 41-yard field goal attempt. Still 7-3 as the game inches toward half. 4:50- Horrible drive for the Bobcat D who allow the Cardinals to go 9 plays and 81 yards in less than four minutes. 10-7 Cardinals with less than a minute left in the half. 4:54- Wow. A deflected Tettleton pass with 38 seconds remaining in the half picked off by Travis Freeman and returned all the way down to the Ohio 8. The Cardinals settle for a FG and have a 13-7 lead at the half. -What a downer. Ohio had seemed to seize control of the game with their first touchdown but Ball State put together a nice drive and then a big play on defense to sneak away with the lead at half. -This was without a doubt Ohio’s worst offensive half of the year. They cannot move the ball on a regular basis today. -Phil Bates on his one touchdown pass has more yards than Tyler Tettleton. That’s all you need to know about how the passing game has been. -The defense broke down on BSU’s first touchdown of the half after tackling and doing their jobs well all half. -Donte Harden has just seven carries. The Cats absolutely need to get him involved if they want to get it going offensively. -God bless the Alumni Marching 110. Well worth the price of admission for fans. -Jahwan Edwards has 91 yards on 15 carries for BSU. Not the bounce back effort the front half of the Bobcat defense was looking for. 5:19- Donte Harden comes out like a man possessed to start the half. Runs over Joshua Howard on a carry up the middle and knocks him out of the game. Brutal. 5:27- Bobcats get a TD on a drive that relied on the vertical passing game. Tettleton completes two passes to Riley Dunlop before a play action pass to Harden in the end zone completes the score. A blocked PAT almost results in two points but holder Paul Hershey makes the stop. 13-13 with 11:28 remaining. 5:38- A short QB sneak completes the counterpunch by Ball State. 10 plays, 77 yards, in 5:11. Things are about to get real for the Cats if they don’t get it together. 5:45- All-American effort by LaVon Brazill on a 74-yard TD reception, the longest play of the year for Ohio. He is one away from tying the all-time reception mark. 20-20 with 5:02 in the 3rd. –Game is tied but Ball State is in the red zone. Defense needs to dig deep if Ohio wants to win. -Remember in the first half when it was nothing but punts? -Ball State has nearly doubled Ohio in time of possesion. -Bobcats held Edwards to just 18 yards, but the pass defense has looked bad. 5:57-Ohio gets the stop in the red zone and Cardinals get another FG. 23-2o with 14:19. 6:02- To give an idea of how much BSU has controlled this game, the Cardinals have run 66 plays to Ohio’s 38. 6:05- Wrapping up the running blog. Keep it to my twitter (@suhlmann12) for the updates in this barn-burner.